The native American scout was able to combine the senses of seeing, hearing, touching, smelling and tasting to be able to open up a world of nature awareness. What kind of nature opportunities would have a scout had? Probably unlimited. The scout would have seen the fox feeding its young and all the other wildlife living life the way modern world people only dream of. Most of the time, modern world people see the deer from the behind bounding away in a fast pace, birds fleeing to a higher branch, raccoons killed on the side of the road by a car and seals hurriedly diving down into the ocean. Since all modern world people see of wildlife is the outcome of an alarm call, that is what they tend to believe that all wildlife's day-to-day activities revolve around fleeing. So, how do some people see wildlife in activities that we can only imagine? It is because some modern world people have added a new dimension to their awareness. They have also learned to combine all their senses together similar to the native American scout. They have learned to see with Outdoor Eyes. In the next few sections, you are going to learn about the five senses and how to use the five senses for better Outdoor Eyes opportunities. The best approach is just being aware of the five senses when an opportunity exists and asking yourself some simple questions. What trees are in this area? Is there a special smell to the area? What type of weather is this moment? Once you are aware of your five senses, they will be a part of you similar to walking. You don't think of placing one foot in front of the other foot when you walk. Before the five senses can be learned, some important initial steps must be taken. If most of the initial steps can not be taken, the discovery of the five senses will not have any meaning. A lot of energy is consistently pushing modern world people from all sides and at all times during the day. Some of this energy turns into mind and body baggage. Some of the baggage of the mind is like walking through life with sunglasses on. The moment the sunglasses are taken off, the world becomes a more brilliant and vibrant place. But, unfortunately, the sunglasses of modern day people remain worn for most of the day and it affects their Outdoor Eyes. What, then, must be eliminated? Allow yourself let go of time. Time has a way of ruining everything that can be enjoyed. Learn how to slow down. 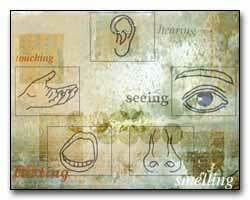 By slowing down, you will be able to use your five senses. Learn to experience the moment and not let yourself drift into the past or into the future. And finally, learn to clear your mind. Only then will you be able to see with Outdoor Eyes. "Am I smart enough to enjoy nature?" Nature is constantly changing. In fact, if you visited the same place for the rest of your life, there still would be new and exciting nature opportunities everyday. In fact, if you happen to know how much time it takes to go from one place to another, you haven't experienced that particular area at all. Learn to realize that there are always new possibilities, even from a place that you have visited over and over. Only then will you be able to see with Outdoor Eyes. Now that you are aware of the Nature Stoppers, you may continue to learn about the five senses. Don't place yourself in a downwind position when trying to see wildlife. In other words, don't let the wind carry your scent towards wildlife since they will possibly move toward a safer area. Plants grow and wildlife reside in areas where their needs are met. The same ducks that you photograph during one part of the season will not be found when their flight feathers are shed. They will be found in the high grass in the marshes to protect themselves from predators. All wildlife goes through transitions based on the time of the year and different phases of their lives. So, if you are constantly visiting the same area and you don't see wildlife, stop and think about the time of the year. The rule of thumb is to look for wildlife in transition areas that accommodate shelter, water and food. The most abundant areas that support these elements are in the transition areas of waterways, forests and meadows. These areas also attract smaller animals that in turn attract the predators. Wildlife reacts the same way that you would during inclement conditions, hot conditions and cold conditions. Think where you would go, based on the weather at the moment, and you will begin to learn to look in all the right places. It will provide dividends for more nature opportunities. Read the Art of Seeing section located below for ways to improve the process of your seeing. Using the Art of Seeing, you will also learn how to look for movement in the outdoors. Wildlife always seems to look smaller than what we visualize when we actually see the animal up close. Sometimes, due to videos or pictures in a book, we have a distorted impression of what size the animal actually is. When looking at the field guides, notice the length and the height of an animal to understand the real size of an animal. Visiting a nature center will improve the visualization of wildlife sizes. Note, most wildlife is seen by looking down in brush or bushes... not looking over. 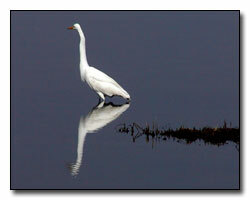 When you locate wildlife, you will be extremely fortunate if the whole animal is seen initially.